MANCHESTER IS GEARING UP FOR CHRISTMAS - Father Christmas is preparing to make his appearance on the roof of the Town Hall, and the Christmas decorations and lights are fully up and running. This update is to present two new additions to the Manchester People series. Both these people, in different ways, help to define Manchester today. If you have any suggestions for future Manchester People, please contact. MANCHESTER'S CHRISTMAS LIGHTS WERE SWITCHED ON in style last night by Mick Hucknall in front of a huge crowd of people, including lots of kids. Before the switch on, there was a pantomime on a portable stage set up in front of the Town Hall. When Turn-On time arrived, the crowd counted down in unison and on the stroke of zero, a magnificent firework display exploded in the sky over Manchester. A medley of classics accompanied the display, including Holst's Planet Suite. It was an impressive event, but in my opinion, last year's switch-on was more memorable, with giant projections on the Town Hall facade, and a giant Father Christmas in attendance (climbing up the clock tower). Yesterday there was no sign of Santa - he's supposed to be appearing over the roof of the Town Hall - maybe he was delayed on his way from Lapland. 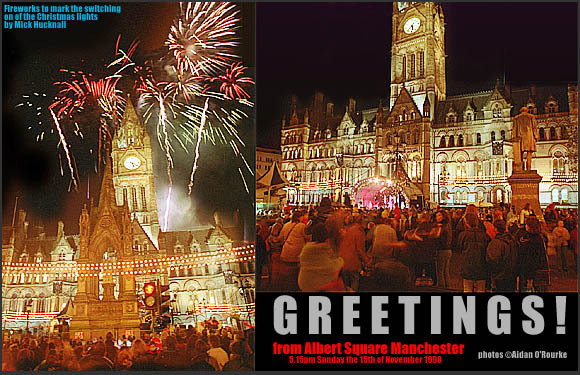 The Alpine Village will be set up in Albert Square in a few days.ÊStill, it was a fun and exuberant start to Manchester's Christmas season, even though I didn't get anywhere near the stage to see Mick Hucknall - there were too many people. "THANKS FOR THE SPONSORSHIP FROM THE TRAFFORD CENTRE" - Well, that was Councillor Pat Karney's typically flippant jibe at the City Centre's arch rival out in Dumplington. In fact, the sponsors of Manchester's Christmas lights are Renault UK. But the Trafford Centre is geared up for the festive season, as you'd expect - the opening in September was timed to tie in with the Christmas shopping season. I made my second visit there on Saturday, and had mixed feelings. It's big, it's dazzling, it's sumptuously appointed, but in essence, it's no more than a shopping centre - just bigger than all the other ones. One of the features is the Orient, a complex of shops, cafes, restaurants, cinemas and other entertainments that stays open after the shops have closed. It has a cruise-liner theme with a huge white superstructure similar to the Queen Elizabeth. But I couldn't help thinking that not so long ago, we had real ships entering the Manchester Docks. If I can't have a real ship, I'd rather have no ship at all. Similar thoughts occurred to me at the sight of the Orient's "New Orleans" theme bars - Disneyworld sprang immediately to mind - And meanwhile, in Manchester City Centre, Sam's Chop House, a genuine piece of 19th century England, is being closed down. 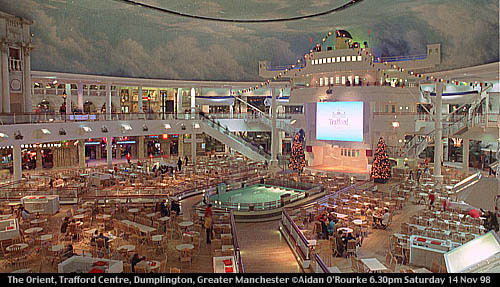 Just imagine if all of Manchester were like the Trafford Centre - perish the thought! But there's good news for the city centre - In a survey carried out by the Experion group, it's been voted top in the north and number 5 in the UK for shopping. AVOID THE JAMS EN ROUTE TO DUMPLINGTON BY PHONING THIS NUMBER: 0906 8230100 The traffic hotline has been set up by ITIS (Integrated Transport Information Services) and the MEN, and is updated every 15 minutes. I phoned on Saturday, and got the lowdown on traffic congestion - in fact, there wasn't any, as I discovered when I drove there - it was around 2pm. Later, there were jams around 5pm on the way out, but we stayed to see "The Exorcist" at the excellent UCI cinema complex, and left later. LAST SATURDAY NIGHT A GROUP OF YOUTHS from an inner city area of Salford were messing about on the street, and decided to have some fun by going down to the M602 motorway bridge. They looked around to find suitable projectiles and started throwing them off the bridge, attempting to hit the cars passing below. It's a bit like a computer game, only more exciting. Then they saw a car approaching very fast - they threw the brick, the driver swerved, but it fell directly on the windscreen and smashed it. At this point, under cover of darkness, the youths ran off. Meanwhile, down below, the car screeched to a halt. The driver and passengers were horrified to see that the front seat passenger had been hit directly in the face, and had sustained horrific injuries. The emergency services were called, and were shocked at what they found. The woman was taken in an ambulance to Manchester Royal Infirmary, where she underwent surgery to rebuild her face. The victim is Cathy Hall, aged 29 of Liverpool. She was just returning home with friends after a night out in Manchester when this happened. I wasn't there, I've just pieced together the events as I imagine they must have happened. What I can't imagine is the mentality of the youths who threw that brick. A senior police officer said recently that some families in the Salford inner city area were "out of control". Right now the police are hunting the youth responsible for the attack - let's hope they find him soon, and let justice be severe. TRANSPLANT COUPLE IAN AND TERESA FLEMING are recovering in a hospital in Philadelphia. "I'm scared to death" said Ian, from Newton Heath before the operation to donate one of his kidneys to his wife, whom he met via the Internet. After the operation, his first words were "Is Teresa OK?". Ian's mother flew over later in the week, joining her son, daughter-in-law and MEN reporter Sophie Tweedale, who has been reporting from Philadelphia all week. It really is an amazing double co-incidence - first meeting by chance through Internet chat, then finding they are transplant-compatible, enabling Ian to give Teresa a life-saving kidney. Doctors say the operation was successful, and they should be out of hospital in another couple of days. YOU CAN WITHDRAW MONEY AND GET TOURIST INFORMATION from various holes in the wall in Manchester - or should I call them "Automated Interactive On-Street Customer Service Machines" - but soon you'll be able to report a car theft, contact Crimestoppers or ask for directions from a hole in the wall. The push-button machines we've become so used to for withdrawing cash are going to replace police stations, under a new plan being tried out in Salford. Eight stations around Salford are to be closed, and a 24 hour divisional HQ will be set up in Swinton. Needless to say, there are complaints: Critics say face-to-face contact is still valuable, especially for old people. But senior police officers stress that the public are already using a sophisticated electronic device to communicate with the police - the telephone. On Thursday, MEN readers voted overwhelmingly against replacing walk-in police facilities with holes in the wall. But like decimal currency, one-man buses and self-service petrol stations, what at first seems new-fangled soon becomes the norm. POP MUSIC FANS ARE GETTING OLDER AND OLDER THESE DAYS, but teenage rock band ALIVE from Rochdale and Bury got the surprise of their lives when they discovered they had won over someone very distinguished indeed: The Queen. They sent a letter to Buckingham Palace enclosing their CD and generally introducing themselves. Weeks later, a letter of invitation arrived, asking them to come and play at the Queen's celebration to mark Prince Charles' 50th birthday. The performance took place last Friday. Another local outfit playing at the party are tuba foursome Tubilate, founded by Altrincham-based Ian Anstey. WEDNESDAY WAS THE ELEVENTH DAY OF THE ELEVENTH MONTH eighty years after the Armistice which ended the First World War. And on the eleventh hour of that day, the whole country observed a two minute silence. Previously, the silence was only held on Remembrance Sunday. this year, even the House of Commons paused in respect for the war dead. In Manchester, officers and soldiers of the Kings Regiment marched from the Cathedral to Albert Square - the city centre was full of military vehicles and police. A gun was fired from the Town Hall to mark the start of the silence and at the end, bells were rung. ANOTHER YOUNG PERSON HAS BEEN KILLED by a train near Humphrey Park station. Rebecca Traverse, aged seventeen, was hit by a Liverpool to Manchester Airport train. The circumstances seem unclear - reports say she left a note, and the police have said the death was "not suspicious". Children trespassing onto railway lines is a continuing problem. I saw some walking along the line near Kearsley last week. The MEN's "Stay Away-Stay Alive" campaign has undoubtedly helped to save lives, but unfortunately, not in this case. A MIDDLETON MAN IS BEING HELD IN THE GULF EMIRATE OF DUBAI and the United Nation has declared the over-long detention a violation of his human rights. George Atkinson, 47, has been held for 20 months now - there were claims he had made illegal payments to golf officials - He designed the Emirates Golf Club, south of Dubai, and founded the Desert Classic tournament. The UN communique states he was detained on 26 Feburary 1997, but wasn't charged until 5 April 1998. Also he wasn't given bail, despite a judge's bail order. His wife says judgement is expected on December 13th. I know Dubai very well, and am surprised - such cases seemed to emerge generally from other UAE emirates or other Gulf states. There are many stories I could tell, but not here! £325 WORTH OF WORMS FAILED TO PEP UP MUFC'S TURF and it is being dug up, to be replaced by a new grass covering to be ready by a week on Saturday, when United play Blackburn. The worms had been employed to allow oxygen to enter the soil and so they would consume dead plant life, but after complaints following last Wednedsay's match against Nottingham Forest on Wednesday, United's management decided to replace it. And worms have also been wriggling on the second Runway site. Environmental officers have been monitoring the number of worms in the soil by using electric probes that pass a current into the ground - this forces the worms to wriggle up to the surface and be counted. Perhaps the MUFC worms could be found a new home near the second runway. SHOWS THIS WEEK HAVE INCLUDED BLONDIE, who played at the Apollo, Ardwick on Thurdsay, and Barney the Dinosaur, whose tv-advertised extravaganza delighted children and adults at the Manchester Evening News Arena until yesterday. ON WEDNESDAY I WENT ON A GUIDED TOUR OF THE CIS BUILDING, Manchester's first skysraper, built in 1962 and inspired by the Inland Steel Building in Chicago. It's a truly remarkable structure, unlike later examples of post-war architecture in Manchester. 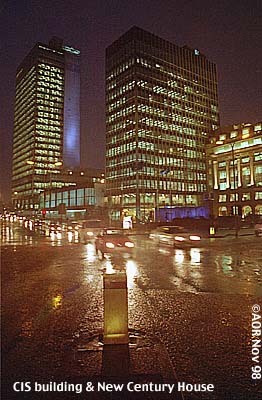 2500 people work in the CIS Building, mostly employees of the Co-Operative Insurance Society. They can eat for free in the giant basement restaurant, where they also have their own branch of the Co-Op Bank. Management grades dine on the 24th floor, with a fabulous view over Manchester. The board rooms, with their attractive stained wood panelling, are on the top floor too. The building was refurbished 10 years ago, and now has listed status - this means it can't be altered or knocked down. In 1962, it was a trend-setter, and still looks good today. But it'll be a while yet before the CIS goes paperless - the law still requires hard copies of insurance documents and other legal records - they're transported from the store in the basement to the upper office floors via an ingenious box-on-rails system controlled by an ancient (7 year old) computer system. TALKING OF COMPUTERS, THIS WEEK'S EYEWITNESS IN MANCHESTER is being put together on my new Macintosh G3 computer, and for the first time I'm using an HTML authoring program, Macromedia Dreamweaver. Scanning of photos is still done on the vintage (3 year old) Macintosh 6100 as I write, using Adobe Photoshop. The new hardware and software will bring new features over the coming months. TODAY WAS A GLORIOUS DAY with blue skies and sunshine all day long. I went to Daisy Nook Country park and a few other locations to take some of the photos you see on this week's page. Last week was cold, and there was heavy rain on Wednesday afternoon - you can see it in the photo above right. It's cold right now in Manchester, with the temperature hovering around freezing point. Your Manchester site is absolutely great. Though I left M/C (Eccles, actually) 30 years ago, and am now living in sunny San Diego, I like to keep in touch with my "roots". 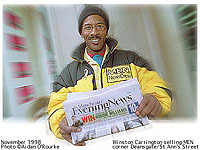 I like the mixture of news and photographs. The news stories are always well-written and presented with a personal touch: the photographs are always first-rate in subject and photo quality. You are to be highly congratulated and thanked for the great service you are providing for we ex-pats. Thanks very much indeed for your message. It's very reassuring to know that Eyewitness in Manchester is being read and appreciated. I was an expatriate myself - one year in Saudi Arabia and four years in the United Arab Emirates - That gives me a special perspective. But I hope that people at home will read as well - quite a few do already. Thanks again, and please keep visiting! I am an American attending university in Oregon. I read Eyewitness and Manchester Online everyday. Why? because I have been to Manchester three times, including two months this summer. Also I have a girlfriend who lives in W.Didsbury and works at the M.E.N. property section. We have been going out for 2 1/2 years, and she has visited me, including 3 months when I lived in Hawaii. Anyway, I like your column a lot, it helps me keep in touch with a city I have grown to love. I am returning for 6 months starting January when I can get a blue card through BUNAC so I can work. p.s. Maybe you can help me find a job! I can't find you a job, but I can answer your questions and point you in the right direction. Please e-mail me any time. Nice to hear the words "...the city I have grown to love". Maybe you could help with Manchester's publicity drive! Aidan As an Ex-pat Mancunian (Prestwich) in Fiji I really rely on your pages to keep me informed with what is going on around Manchester. Thanks for the effort - ex-pats in far flung places around the world appreciate it. Wow, that's the furthest-flung location an expat Mancunian has contacted me from. But didn't you know? There's a bus to Fiji from Piccadilly bus station. Don't believe me? Just ask at the enquiry office. You may not know it but you have a silent but enthusiastic following in the Pacific Island. I know people in Fiji, the Papua New Guinea highlands and the beaches of Vanuatu who have "Aidan's Photos" of their favourite or local haunts from home as their screensavers. 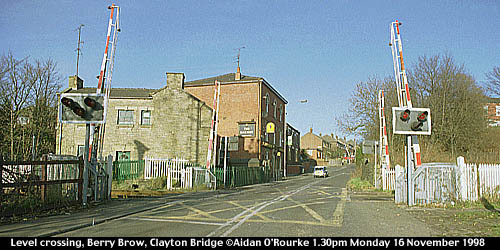 (I personally have my local pub The Wilton on bury New Road in Prestwich from your collection as mine!). Hi Aidan, Great to find your page on the web. I'm an ex-Mancunian who has lived in Australia for 30 years. I'm a retired journalist and now live down `on the edge of the world' in the far south of Tasmania, which has to be one of the most beautiful places on earth. The weather is beautiful at present; however, it can snow any day of the year! Haven't been to Manchester since a long stay in Ireland in 1978/9 when we went over for a trip to visit various relatives. Our eldest daughter lives in London but is, at present, visiting relatives in Manchester with her husband. Thanks very much for your message - especially appreciated coming from a retired journalist. 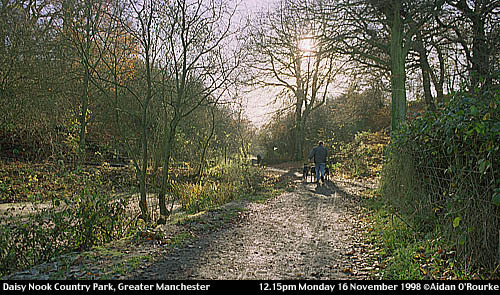 I'm hoping snow will fall soon, so I can take some nice snowy photographs of Manchester and surrounding areas. Enjoy your summer! 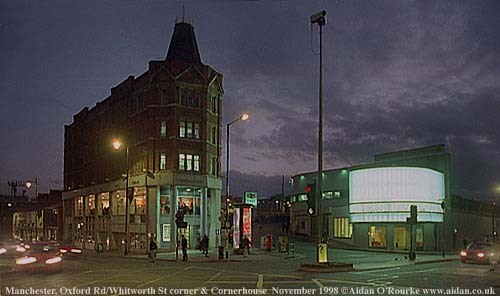 Thanks very much for the message - The cinema is Screen One of the Cornerhouse arts centre. Previous to that it was the Tatler Cinema Club, showing X-rated films and before that, it was, I think, the Manchester News Theatre, showing newsreels. The bright light in the picture is the new frontage which was added to Cornerhouse Cinema 1 earlier this year.